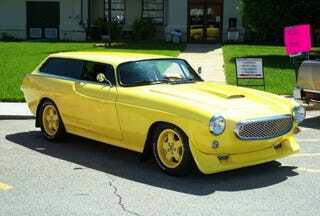 A Custom Volvo P1800ES For $24,000? Chopped is a popular show on the Food Channel that lets 4 chefs vie for a ten-grand prize. They'll need to cook up more than that to get to the asking price on today's Nice Price or Crack Pipe Volvo, which by the way, is also chopped. What came first, the chicken or yesterday's 1997 Toyota Previa LE S/C? Well, while you are pondering that question for the ages, let's just see who that ovoid van's price fared. Ooh, not so good. Fully 75% of you felt seven-large was too much for the supercharged people carrier, and almost 60% of you also decided to have eggs for breakfast. Subliminal messages, Booyah! Could This Dropped Toyota Previa S/C Go For $7,000? Not so subliminal is today's 1973 Volvo P1800ES. Now, we love old Volvos, after all they have a well-earned reputation for loyalty and fidelity. I mean, have you ever heard of a Volvo that said it was just going out for a pack of cigarettes and then never came home again? No, I didn't think so. Nope, old Volvos are the cars that stay by your side through thick and thin, no matter how many miles you have to go before you sleep. Not only that, but this particular custom job is wild enough looking to keep you up at night. The P1800 debuted in 1961 as Volvo's second attempt at a sports car. The first 6,000 cars were built in England by Jensen Motors, with that company subbing out the unit body shells to Pressed Steel in Scotland. Jensen's quality control was about what you would expect from a small British manufacturer in the '60s, and the only two things the Scots are good at making are whiskey and trouble. Those factors drove Volvo to cancel their contract and bring the P1800 production in-house. Over the next decade the sporty Volvo saw a switch from the 1,778-cc B18 to the 1,998-cc B20, and in the E and ES a change from SU carbs to Bosch fuel injection, among other updates. The last big change for the P1800 was the addition of the cool ES sport wagon, of which we have an example today. This car is claimed to have a fairly stock drivetrain - 125-bhp B20 and 4-speed/OD stick - but that's about all that is stock. First off, you'll note that it's been redone from its Ferrari-aping grille to its iconic all-glass hatch. Bumpers have been bumped off the bill and the car is lowered on what are described as sport springs and Koni shocks. It also rides on a set of later 240 wheels painted in Lemon Pledge. The biggest deal here however, is the roof which has been chopped by a full three inches. Now that might not seem like much but just ask a lady if getting three inches less of anything is a good thing. The P1800's roof was long and low to begin with, and this takes that look and turns it up to 11. There are a number of other customizations that have been done to the car, including some side strakes that prove such things are never a good idea, and a front air dam that looks like it could make the second half of the car's speedo superfluous. Everything's done in metal and you can take a gander at some of the build in the ad's pictures. Twenty-four grand is what it will take to call this custom Volvo your own, that or any number of late-model trades. Of course we don't deal in bartering here, what are we, socialists? We work in cold hard cash, and because of that, I now want your opinion on whether this chopped P1800ES is worth that $24,000. What do you think, is that a deal for so eclectic a custom, considering the apparent quality of the work? Or, does that price need to be chopped as well? Springfield MO Craigslist, or go here if the ad disappears. H/T to BigBlockBear for the hookup!